BBC iPlayer, commonly shortened to iPlayer, is an online service developed by the BBC which lets you catch up on the last week's television and radio. The service can be used from computers on the BBC website at bbc.co.uk. It can also be used from games consoles, cable television, smart phones and tablets. 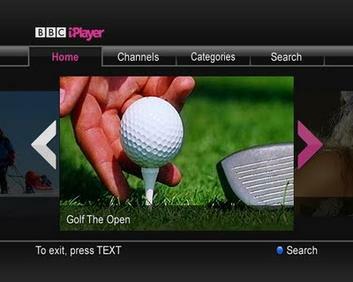 BBC iPlayer was first called the Integrated Media Player (iMP), the Interactive Media Player, and then MyBBCPlayer. 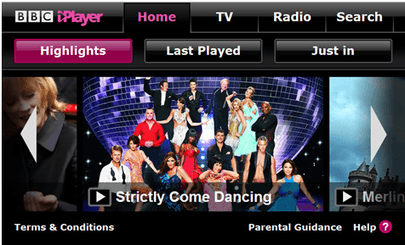 BBC iPlayer left Beta and went live on 25 December 2007. On June 25 2008, it was announced that a new-look iPlayer would be launched. The new version is now live. In July 2007 the BBC started a small BETA version of iPlayer as a trial service. 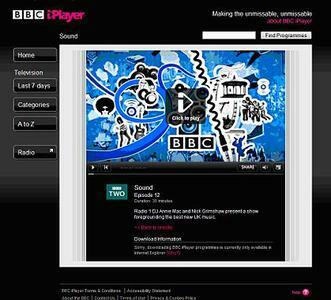 During this BETA time, iPlayer was only available as a download (WMV format) meaning that any person who did not have Windows loaded on their computer could not use iPlayer. This was not a popular move, and the BBC was put under pressure to allow all people to use iPlayer. On Christmas Day 2007, iPlayer was no longer in BETA. People could now also watch programmes on the website instead of having to download the video as people had to do before. This meant that people who did not have Windows installed on their computers could use iPlayer as well. This made iPlayer a lot more popular and easier to use, so much so that 3.5 million programmes were viewed in a fortnight. BBC iPlayer Facts for Kids. Kiddle Encyclopedia.